See below for the notes from our Coaches Forum. Including changes to next year's season. 3.5.4 Games will be refereed by the Team Coaches to allow teaching moments throughout game. 3.5.6 The concept is to teach the fundamental skills of basketball in an environment that encourages this learning coupled with having fun. Each week we will build upon the skills and the enjoyment of playing basketball. Each session will conclude with a game or games as necessary (based on numbers) for the players to compete. Each week these teams will be made up of different players to ensure fairness in the games and encourage teamwork within the players. 3.5.7 Basketball will be a "Rookie Ball" which colors, weight and grip help the child learn proper technique and increase eye/hand coordination. 3.5.8 All teams must play low pressure defense in order to allow players to learn offense & defense correctly. 3.5.9 Game will have a running clock, except free throws, until the last three minutes of the quarter. 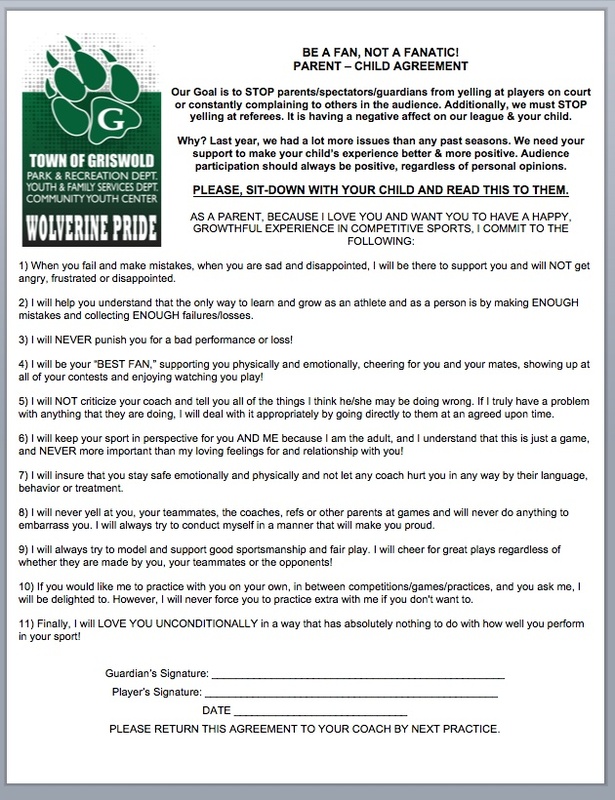 3.5.10 All Coaches are to Submit their Rosters/Rotations to the opposite Coach each game to ensure equal playing time. 3.53.11 All players are to be taught defense focusing on foot movement and keeping a gap between the ball-handler, supported by keeping hands straight up in the air to avoid injury caused by swiping at the ball, or too aggressive pressure on ball handler or other players on offense. 3.6.2 Substitutions every 4:00 minutes of each 18minute half. 3.6.3 Two 18 minutes’ halves with running time, clock stops during foul shots, timeouts, injuries, on the whistle with two minutes left in each half, and referee’s discretion. 3.6.5 Free throw line will be moved up. 3.6.9 Basketball will be a "Rookie Ball" which colors, weight and grip help the child learn proper technique and increase eye/hand coordination. 3.6.10 No full court press at any time throughout the season. 3.6.11 Half-Court Press is allowed after midseason, coaches must decide before game. 3.6.12 Free Throws are allowed to be shot three large steps in from foul line. 3.6.13 Game will have a running clock, except free throws, until the last three minutes of the quarter. 3.7.14 All Coaches are to Submit their Rosters/Rotations to the opposite Coach each game to ensure equal playing time. 3.7.2 Substitutions every 4:00 minutes of each 18minute half. 3.7.3 Two 18 minutes’ halves with running time, clock stops during foul shots, timeouts, injuries, on the whistle with two minutes left in each half, and referee’s discretion. 3.7.5 Each coach must have a volunteer run the clock and scoreboard per half or whole game. 3.7.8 Basketball will be regulation. 3.7.9 No full court press at any time throughout the season. 3.7.10 Half-Court Press is allowed, coaches must decide before game. 3.7.11 Mercy rule: If team is up by 20, that team score will be paused until the difference is <20 points. 3.7.12 No one and one foul shots, or two foul shots on and after the tenth foul of each half. 3.7.13 2minute overtime period one full timeout per overtime, no carryovers. Second overtime will be a free throw contest between one player from each team, from each team selected by the Coach. First to make a shot win. Other team is able to match. 3.7.15 If team has less than 5 players, the opposite team may share a player to allow the game to be completed. 3.7.16 Free Throws are to be shot from foul line. 3.7.17 Game will have a running clock, except free throws, until the last three minutes of the quarter. 3.8.18 All Coaches are to Submit their Rosters/Rotations to the opposite Coach each game to ensure equal playing time. PLEASE BE AWARE THAT COACHES MAY CHANGE RULES & REGULATIONS IN A COACHES MEETING BY A MAJORITY VOTE. PLEASE NOTE: LEAGUES MAY CHANGE DUE TO LOW ENROLLMENT. FROM TEAM LEAGUE PLAY TO PLAYER CLINIC PLAY. 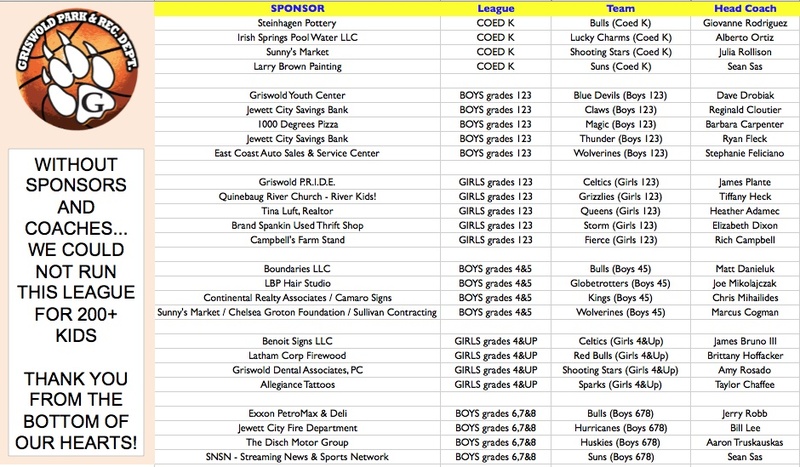 Thank You Sponsors & Coaches!